The collective role of three major powers Russia, India and China in Afghanistan is set to increase in coming months as the NATO-led security forces plan for a major withdrawal this year. 2014 provides the right occasion for Russia, India and China (RIC) to coordinate their policies for peace, stability and development in Afghanistan. These objectives were reiterated by representatives of the three countries during their meeting in Beijing this week. The meeting is prominent on two accounts. First, it is the rising assertion of RIC for peace and stability in Afghanistan. Second, and related, it is regionalism that assumes significance. RIC though about a decade and half year old has become increasingly assertive in recent months. In its meeting in New Delhi last November the group emphasized its role to play a regional balancer. The meeting is a continuation of this assertion, and as the joint press release made it clear that “the security in Afghanistan is important to the country and the region”. The meeting in the beginning of 2014 also indicates the seriousness of the group to act collectively as the international forces withdraw. That Afghanistan is more amenable to regional solutions was emphasized during the meeting. Imposition of external models by means of force has failed in the war-torn country. It has been increasingly realized that the regional powers which have experience and knowledge of the country and its various dynamics should steer its transformation from a war zone to a peaceful democratic state. The three powers India, China and Russia are linked, i.e. India shares a border with China and China shares border with Russia, and all these countries are not far from Afghanistan. A thin strip of Kashmir under Pakistan’s control separates Afghanistan from India. While China’s Muslim majority Uyghur region is linked to Afghanistan, Russia is linked through Central Asia in which it has spheres of influence. RIC hence is placed in a position to craft peace and stability in Afghanistan through its geographic proximity – to which their historical and cultural connections are added advantages. The resources of these countries and their craving for peace and stability in consort with immediate neighbours of Afghanistan can prove effective. The joint statement in Beijing reiterated the group’s resolve “for a strong, united, stable, peaceful and prosperous Afghanistan”. The countries also agreed for further talks on this issue. In this backdrop the recent statement of Kirill Barsky, the Russian envoy to Shanghai Cooperation Organization (SCO) that the organization will not replace NATO as a stabilizer and peacebuilder assumes significance. Barsky stated, “The SCO is not prepared to assume the responsibility of ensuring security in Afghanistan itself”. The statement is significant owing to two reasons. The SCO will not play NATO in Afghanistan. NATO might have played a role in tackling the forces of the Taliban and extremism, but its role has been subject to contestation. A similar role by the SCO may prove antithetical to the very goals of the organization which aims to foster peace by defeating terrorism and extremism. RIC is better poised for the conflict transformation in the region as it is not associated with any particular ideology or security agenda which clash with broader goals of peace and stability. The members of the grouping have regularly consulted with other countries of the region such as Pakistan, Central Asian countries, and also Afghanistan. The key messages here are coordination and consultation, rather than imposition to chart out a regional solution to the vexed problem. Another key factor that moves the three countries to think and act seriously in Afghanistan are the menaces of terrorism and extremism. The RIC in their New Delhi meeting last November had emphasized that extremism and terrorism need to be countered collectively. Al Qaeda, Taliban and their brethren such as Hizbul Mujahideen, East Turkestan Islamic Movement or the Chechen radicals promote dogmatism and separatism through violent means. Particularly for this year, Russia has added concern as it is organizing the Olympics in Sochi which the extremist organizations have repeatedly threatened to target. Afghanistan is a fertile soil for these forces, and none of these countries will be interested in a future Afghanistan that harbors these forces. India is afraid of prospects of revival of militancy a la 1980s when the withdrawal of the Soviet forces from Afghanistan had given a push to militancy in Kashmir. Similarly, Russia and China which are countering these forces in their south and east respectively will not be interested in their escalation after the withdrawal of the NATO forces. Add drug trafficking to extremism and terrorism, these three menaces provide sufficient rationale to RIC to act collectively in their common interest. Not completely unrelated, in a recent a move both Russia and China came forward to support India’s policies on Bangladesh particularly against the rise of radical forces like Jamaat-e-Islami. 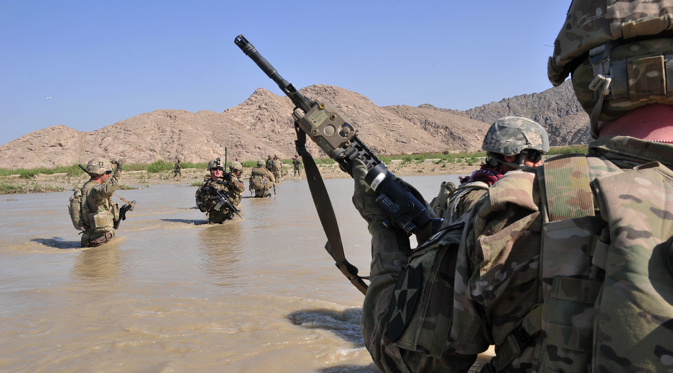 International politics abhors vacuum, and the situation in Afghanistan is no exception. Till the war-torn country stands on its feet and emerges as a vibrant democracy with a stable economy, it will be subject to pulls and pressures. How far these pulls and pressures will work for the betterment of the country only time will tell. From this point of view 2014 will be crucial. One thing, however, is certain. Force and unilateral intervention have proved failures in case of Afghanistan. A collaborative framework, supported by regional powers, may prove effective for peace and stability. The RIC meeting this week furthers this spirit.